MOSCOW, August 4. /TASS/. Russia’s newest helicopter Mi-28UB (with dual controls) will be tested in Syria, the CEO of the Helicopters of Russia company, Andrei Boginsky, has said. "Currently the Mi-28N helicopter has a crew of two - the pilot and the operator. The task of the new project is to turn the helicopters into a combined combat and training aircraft, with the full set of controls in front of both seats. We would like these helicopters [Mi-28UB - TASS] to undergo tests here [in Syria]," Boginsky said in an interview on the Zvezda TV news channel recorded at the Hmeymim air base. Earlier, the Helicopters of Russia general designer, Nikolai Pavlenko, said eight new Mi-28UB helicopters would be provided for the Aerospace Force later this year. 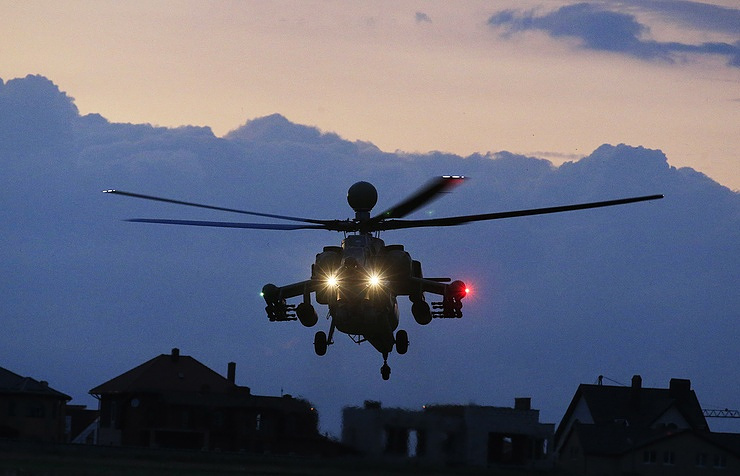 The chief of the Aerospace Force’s army aviation combat training, Nikolai Pavlenko, said that the first Mi-28UB helicopters would be delivered to the 344th center of combat training and retraining center in Torzhok. Mi-28UB is a combined combat and training configuration of the attack helicopter Mi-28N Night Hunter. It began to be developed in 2010. The double control function is one of its key features. Although the helicopter is meant for training pilots, it retains all combat capabilities and can attack enemy targets and vehicles.